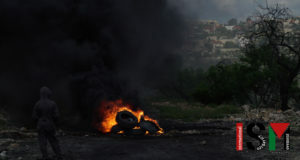 Friday 11th of August, the Israeli forces violently dispersed the weekly Friday demonstration in Kafr Qaddum. The villagers have been protesting since 2011 against the closure of their main road that leads to Nablus. The closure of the road complicates the everyday life of the Palestinians living in Kafr Qaddum, it restricts their right to free movement and furthermore adds economical pressure to the villagers who are forced to spend more time and money on public transportation. The closed road leads to the agricultural areas surrounding Kafr Qaddum, prohibiting the farmers from accessing their land freely. 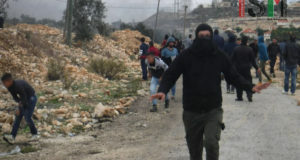 Friday 11th at 1 PM the villagers of Kafr Qaddum began the demonstration. A group of Palestinians and international activists marched towards the road that leads to Nablus, passing the illegal settlement of Kedumim. The demonstration was immediately interrupted by the Israeli occupation forces. They blocked the road at the entrance to the village, and started shooting rubber coated steel bullets, live ammunition and throwing stun grenades. The demonstration was dispersed, and people sought shelter nearby. 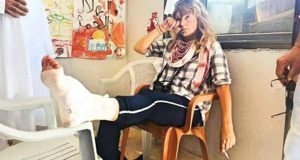 The Palestinians and the international activists tried to continue the demonstration, but were continuously pushed back by the violence used by the Israeli occupation forces. The soldiers were strategically placed around the village, ensuring that the demonstration could not move elsewhere, and firing at the demonstration from different angles. The following day, Saturday 12th, the villagers held another demonstration. Three international activist were denied from joining the protest and were detained for three hours by the Israeli occupation forces. During the past 6 years of the weekly Friday protest, the Israeli occupation forces has continuously used violence to repress the villagers.